The P-Model emphasizes straight tall sidewalls with a roof that has a peak. Great for backyard storage, one or two car garages and workshop use. They range from 14' to 30' in width and are simple to customize. shape has a slight slant wall with a gambrel design that maintains superior strength. It has great side wall clearance for applications that involve wall workbenches and equipment repair. Available from 20' to 40' wide and make an ideal hobby workshop or garage. carries high sidewalls and roof area for large open spaces. Perfect for warehouses with racks, distribution facilities and commercial storage buildings. No columns or interior posts optimize the floor space. They range in size from 10' to 50' and over in width. solves many diverse uses. Agricultural storage for livestock, equipment, hay or grain, residential personal workshop, RV, vehicle and boat storage. This model offers the lowest cost per sq ft and has 100% useable space with no poles. Sizes available are 16' to 120' wide and unlimited lengths. R-Model design is ideal when only a roof system with no sidewalls is needed. from 10' to 140' wide. T-Model design is ideal for uses that require a roof and only one sidewall enclosed. from 16' to 80' wide. The Q-Model steel building is the strongest type of arch building manufactured by Archcore. 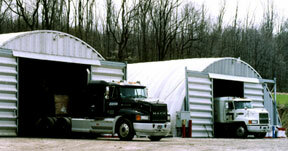 Their durability and economical building price are unmatched by any other type of prefabricated metal buildings sold. They are the ideal solution for agricultural storage buildings, recreational buildings, truck garages, grain and corn storage, covering hay bales and low cost commercial warehouses. Archcore Q buildings are only manufactured in the USA and designed to be stronger and require less maintenance than wood pole buildings and rigid frame steel barns. The Q Model is available in a range from 16'-120' wide and unlimited lengths. The incredible strength of the arch shape and super heavy gauge steel used in manufacturing, allows the Q-Model to span wider widths more cost effectively than other types of pre-engineered steel buildings. This makes them ideal for many recreational metal buildings including skating rinks, paintball arenas, indoor baseball practice facilities, batting cage buildings, and covered riding arenas. Archcore prefab quonset Q models are made with Galvalume®, a specialty coated steel comprised of aluminum, zinc and silicon. It offers superior protection against corrosion and comes with a 30 year rust through warranty. No painting or special treatment of the building is required and once erected they are virtually maintenance free. Since every Archcore building is prefabricated and predrilled for a fast do it yourself construction, you will save thousands on erection labor. The Q Model is preferred by many farmers for prefab farm sheds for equipment and commodity storage because most buildings can be erected with general labor and do not require heavy equipment or cranes. Have any questions? Need a fast price on a quonset hut style Q building? Call Archcore today at 1-800-844-1570 and let us show you how affordable the strongest arch building model can be. The Q-Model features a tried and true military design for the best combination of space usage and structural strength. A military design that allows for superior strength in widths up to 100 feet. Withstands the worst that Mother Nature has to offer. So versatile they can be used for everything from steel storage buildings, industrial shops, hay, grain, and livestock shelter, skating rinks, and even an indoor softball stadium! View The Gallery of Q-Model Steel Buildings! For 1 or 2 car garages. Great for small shop or home workshop building. Arch farm buildings ideal for grain, corn or hay storage. Industrial metal buildings for utility, generator or pump shelter. Keep trucks safe and secure in metal truck repair shop kit. Farm equipment storage, horse steel barns, metal pole buildings. Create your home with a DIY steel house kit. Backyard storage sheds for home, industrial and agricultural shed. Perfect for an aircraft, helicopters and small plane hangar. Batting cages building, sports arena, metal pool cover. Small retail stores, prefabricated office buildings, classrooms. Garage building kits for your autobody shop.